With a 10-bit frame-synchroniser for each input, one-channel of up-conversion, two HD/SD-SDI outputs and one scalable DVI-D output, the AW-HS50 offers powerful, broadcast-quality switching capabilities for mobile production, AV facilities, small studios, and event video. As a “50 Series” component, the AW-HS50 provides IP links to the AW-RP50 remote camera controller, enabling automatic selection of the currently controlled P/T/Z camera video on the switcher’s AUX bus. Five inputs : Four SDI inputs and one DVI-D input come standard. Three outputs : Two SDI outputs and one DVI-D output come standard. The AW-HS50 supports a variety of HD/SD formats, including 1080/24PsF, as standard. System frequency is 59.94 Hz/50 Hz/24 Hz switchable. This makes it ideal for digital cinema production and worldwide operation. A Frame Synchroniser is embedded in all inputs. This enables asynchronous video signals to be switched without glitches. The AW-HS50 is equipped with an SD/HD up-converter function for two inputs (SDI IN 3/SDI IN 4), and a dot by dot function that can be used for P-in-P display of HD images from SD footage without degradation. A video processing function with brightness, pedestal level, saturation, and colour phase correction is also provided for four inputs. Transitions: 13 wipe patterns and mixes. The built-in key function lets you select from linear, luminescence and chroma keying. One P-in-P bus and one Aux bus are included. A Bus transition function (P-in-P bus and Aux bus switching effect) enables Mix transitions. Two 8 bit still images can be saved in Frame Memory, and used as bus footage. The still images can also be transferred from a PC over a LAN network. Five crosspoint buttons in each A bus and B bus (for a maximum of 10 with the Shift function), a Cut button, a P-in-P button, a Key button and an FTB button allow direct control with this simple panel layout. A slide lever also provides easy control of transitions, P-in-P, and Key Fade In/Out. Various functions can also be assigned to two user buttons (for a maximum of four with the Shift function) for one-touch operation. The built-in Multi-viewer Display function can simultaneously display various images, including program (PGM), preview (PVW) and input signals, on a single monitor. The screen may be split into 4, 5a/5b, 6a/6b, 9 and 10a/10b sections. This function displays the level of the embedded audio signals (group 1/1ch, 2ch) superimposed on the SDI input signal. By linking the AW-HS50 to the optional AW-RP50 Remote Camera Controller with an IP connection* over a network, a number of remote operations become possible, such as operating the optional AW-HE50S or AW-HE120 HD Integrated Camera. The AW-HS50 and AW-RP50 have a unified design and half-rack size, so they can be mounted side by side in a single rack. * Only one AW-RP50 can be connected to the switcher via an IP connection. And connection is not possible with a public network. The setting data (iris, gain, etc.) for the AW-HE50S or AW-HE120 HD Integrated Camera can be displayed on a split screen using the switcher's Aux output or Multi-viewer output. The switcher's On-Air tally data can be sent to the Camera Controller. The switcher's bus footage (Aux, PVW, P-in-P, Key-F) can be selected at the Camera Controller. Switching of the bus footage can also be linked to the camera selection. The switcher's Multi-viewer Display can also be changed at the Camera Controller to a full-screen display of the camera image (Aux bus only). This supports the camera's Focus Assist function. The Pan/Tilt lever and Zoom button on the Camera Controller can be used to change switcher parameters. 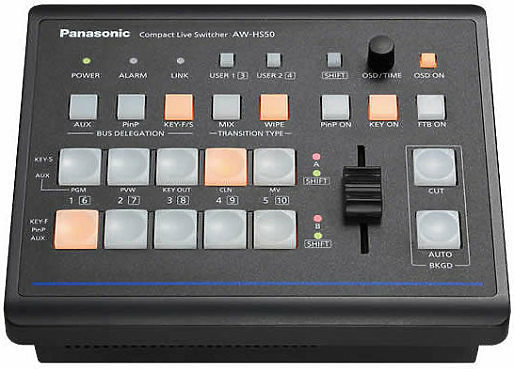 Hire the Panasonic AW-HS50 HD Switcher from Procam. Best service and rental rates for the Panasonic AW-HS50 HD Switcher and all cameras, lenses, sound, lighting and grip.